teach with creativity. embrace technology. We had our first snow day for Arlington County yesterday and therefore, my instinct as a 1:1 iPad classroom teacher was to immediately resort to what I did last year: flip a lesson and send it to my students. BUT….I just couldn’t. I mean, come on! It was their first snow day and they’ve been working so hard. One day isn’t going to doom them for SOL tests. Let them go outside and play! Then, I started to wonder what some of my students were really going to do on this snow day. I wondered how many of them would coop up inside napping, playing video games, and watching TV. How many of them knew that on a cold day like this, you can also read and write as part of enjoyment? Rather than giving them dreaded work to do, I thought it’d be much more meaningful and fun to show my students a reading and writing culture at home. My county started a great hashtag, #snowdayAPS to get the community sharing all the fun and learning happening at home. Unfortunately, while my kids and I tweeted in class, they don’t have access to our Twitter account for safety reasons and therefore, wouldn’t be able to join in on our county’s hashtag. My solution was Padlet. Free and no account needed for anyone. Just a simple URL and we’re good to go. I made a board and shared it to friends and teachers I knew on Twitter, Facebook, and via email. I posted it on Schoology so my students could see it and gave them directions. You know, we always talk about assessment being so crucial and we test the heck out of our students. 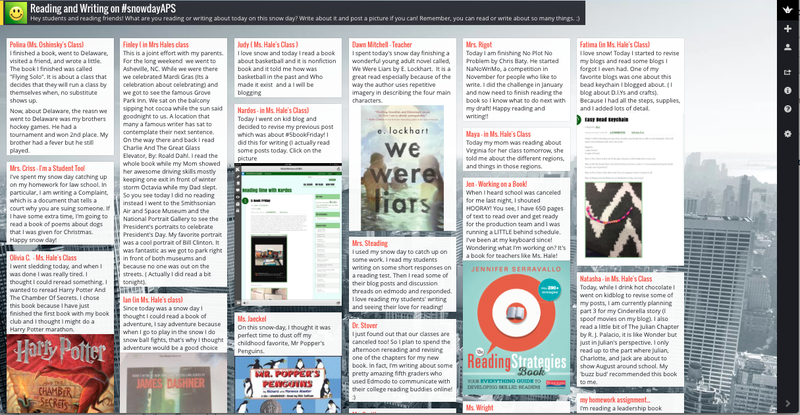 This #snowdayAPS padlet gave me more information about my students as readers and writers than a standardized assessment. See, all of my students get notifications when I post on Schoology so I know all of them received it, but not all posted on Padlet. Those who did told me a lot about their growth this year as readers and writers. I didn’t tell any of them that they had to post. It was completely optional. It made me proud and I’m excited to go back and help instill a culture of reading/writing at home for my other students. If you read carefully on the Padlet board, you’ll notice that my students who did post didn’t just tell you what they read. They gave us their rationale about it, posted a photo, really thought about what they wanted to say. Did you also notice the spelling and grammar? I promise you their writing did not look like this even two months ago. We started blogging in December focusing on their own “niche”. The authenticity of this writing made a huge impact on my students and it showed yesterday on the #snowdayAPS padlet. Their posts (remember, they’re only 10 years old) blended perfectly with the teachers and professionals who posted. Sadly, I don’t think we’ll get another snow day but if you do, maybe give this a go! It was by far the most fun I’ve had as a teacher watching my students, colleagues, mentors, and friends from afar come together all for the love of reading and writing. ← Join the “Book Battles” for March Book Madness! Love this Katharine! Always enjoy seeing what you’re doing. Thanks, Katie!! Means a lot coming from you. I loved this idea and used it with my students on their snow day. I have a question about yours, though. The posts on your Padlet wall are all nice and neat. Mine turn out all willy-nilly – overlapping, different sizes, etc. How do you get them lined up like that? Hi Holly, I replied via twitter but in case anyone else wonders the same question, here’s the answer: Go to settings, click on Layout, choose Grid Layout. Done!